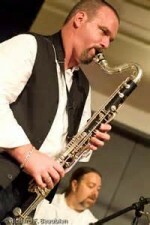 Todd Brunel is a clarinetist, sax player, composer and producer who performs extensively as a classical and jazz musician. He is a member of the Armenian folk jazz project Musaner, Know Orchestra, the Eric Hofbauer Quintet, Sonic Explorers, and co-leads the avant-funk band, The Circadian Rhythm Kings. He performs frequently with pianist Peter Cassino and has worked with Laurence ‘Butch’ Morris, saxophonist, Daniel Carter, guitarist Garrison Fewell, and multi-instrumentalist and composer, John Tchicai. Mr Brunel is the director of the Vortex Series for New and Improvised Music and has been awarded grants by the Somerville, Cambridge, Arlington and Massachusetts Cultural Councils. In 2012, he formed Opal Ensemble with pianist Paul Carlson and violist Anne Black, a group dedicated to discovering new 20th and 21st century repertoire and often neglected works of the past. He has played principal clarinet with Opera Ebony of Harlem, the Bulgarian Virtuosi and plays frequently with the Lexington Symphony, the Claflin Hill Symphony and the Reagle Music theater. Some of his recent appearances include Carnegie Hall, Brandeis University, Dartmouth College, the Longy School at Bard College, Spazio Teatro NO’HMA in Milan, the Out of the Box Festival, Gould Academy and the Academy of Music Dance and Art in Plovdiv, Bulgaria. Mr Brunel is on the faculty of Wheaton College and is a NEST artist with the New England Foundation for the Arts. He is also on the faculties of the Powers Music School in Belmont, MA, the Lexington Music School, and Cushing Academy in Ashburnham, MA.